Dr. Lisa Staten is an Associate Professor and Chair of the Social and Behavioral Sciences Department at the Indiana University Fairbanks School of Public Health at IUPUI. 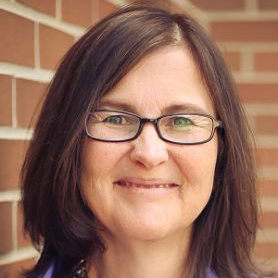 She is also an Associate Director of the Community Health Partnership (CHeP) of the Indiana Clinical Translational Sciences Institute (https://www.indianactsi.org/chep/). Prior to coming to Indiana, Dr. Staten was at the University of Arizona where she worked with community partners along the US-Mexico border to reduce risk factors for diabetes in Latino communities. The overarching theme of Dr. Staten’s research is improving health equity through community engagement. A great deal of her work has focused on chronic disease prevention using community-based participatory research methods. More recently, she is shifting her focus to developing interventions that address the social determinants of health. She has published in the areas of minority health, intervention design and evaluation, community engaged research, and coalition building. In partnership with the ICTSI CHeP, we are developing resources and systems to assist coalitions throughout Indiana. Ultimately, the goal is to improve the health of the people of Indiana through high functioning health coalitions. This project is a collaboration between FSPH and Anthem to increase access to smoking cessation services for people living in low income housing. We will engage housing residents to design the program. In partnership with the Healthy IU program, we have completed two rounds of a survey to assess the health of full-time employees as well as the environmental assets and challenges to a healthy workplace. We are planning to repeat the survey in 2019.